In a surprise announcement on July 23rd, Wizards of the Coast revealed two D&D campaign settings. For those new to the term, a campaign setting is the world in which your D&D game takes place in and all of the rules that govern that world. The major news was the first ever for-purchase product combining Magic: the Gathering content into the Dungeons & Dragons rules set. 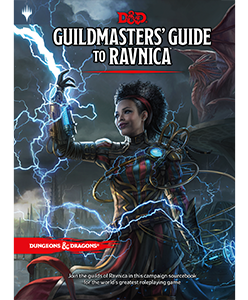 Ravnica: Guildmasters’ Guide to Ravnica will be in game stores on November 9th, and available worldwide on November 20th. The announcement came on the heels of an accidental product listing for the book on Amazon. This spurred a feverish social media discussion about cross-promoting an “outside property” without first releasing 5th Edition content for some of their most-requested classic campaign settings. Fans have been clamoring for the likes of Dragonlance, Planescape, or even the official original D&D campaign setting, Greyhawk (Much love to Blackmoor!) and some feel slighted by a card-game setting getting a turn first. This has not been the first time that official Magic content has been published for D&D or even for 5th Edition. But, it was always free downloadable content on the Unearthed Arcana column of the D&D website, not a full product. As we near the book’s release we’ll talk more about Ravnica, but for now, there was another very interesting announcement made at the same time. In a possible attempt to appease the community, Wizards also announced a digital downloadable book for the Eberron campaign setting. Eberron was created by Keith Baker as an entry for a Fantasy Setting Search contest that Wizards held in 2002, and Keith has continued to work with Wizards in updating the setting as new Editions came out. In fact, an unofficial update for the setting came out as free downloadable content also in the Unearthed Arcana column on the Wizards site in 2015. In addition to the tabletop RPG material, Eberron is the setting for the long running MMO, Dungeons & Dragons Online. Given these reasons, Eberron may have been an easy choice if appeasement was the goal. Whatever the reason for this decision, there is now an official 5th Edition Campaign Setting for Eberron, and it is already available for purchase as a digital download! If you’re looking forward to more Eberron content, or wondering if this so-called “deep conspiracy against the purity of the game” is worth purchasing, then keep reading. First off, Wizards has clearly been working on this product for a while. It doesn’t look “rushed together.” The art is full color and there is a lot of it, though not all of it is brand new: several classic Eberron pieces from previous editions are recognizable. The book also comes in at 176 pages which means this is a full release, not just the supplement that was available back in 2015. The book (like any good campaign setting) is mostly about what the world is like and less about game mechanics. Each chapter covers a different aspect of this theme. Chapter One provides a good introduction to the world if you’ve never played it before. It also refreshes veterans on the important motifs and events in the world’s history. What has made Eberron so appealing to fans is the pulp noir feeling of the world. Adventures are grandiose expeditions deep into unexplored lands with intrigue around every corner. Another draw to fans, is that alignment (the two-word description of a character’s ethical outlook, i.e. Chaotic Good) does not always fall along stereotypical lines. An orc or goblin may be as likely to be good-aligned as it is evil. 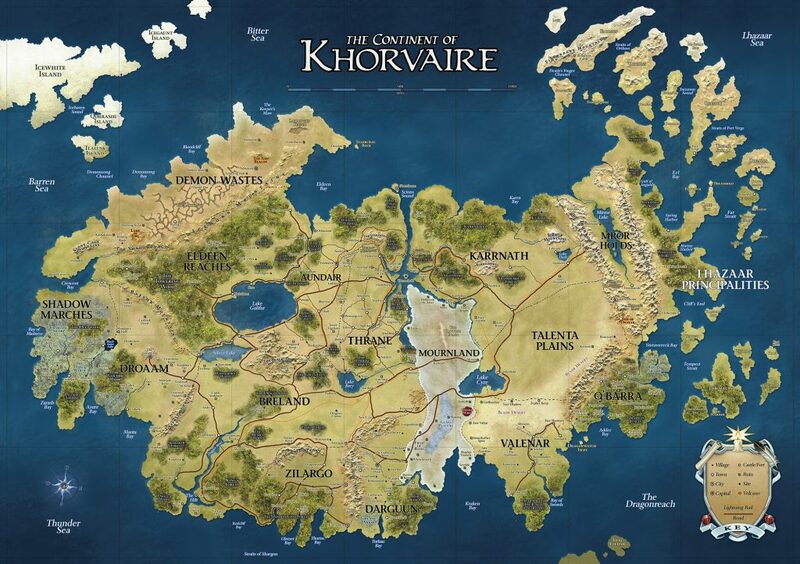 Chapter Two is the gazetteer of the book, detailing the geography and nations of the primary continent, Khorvaire. It also includes entries about the cultures of Khorvaire such as the ubiquitous nature of magic. Technology has advanced in this world to an almost steampunk level, but with magic as the fundamental power source. This is another reason why Eberron is so popular. It appeals to a different fan base than traditional fantasy and is refreshing for people who want a bit of science fiction in their D&D. Chapter 3 spends time detailing some of the favorite unique races like the mechanical Warforged or the mysterious Kalashtar. One of the newer additions is the Warforged Envoy, which was not necessarily created for combat but for more specialized purposes like an infiltrator. It’s a welcome addition that makes the player think about their character’s origins. In addition to the world-specific races, it also discusses how the other D&D races, old and new, fit in . One of the motifs stated in Chapter 1 is that “There’s a place for everything in Eberron”. This gives suggestions on how to make that inclusion work. Chapter 4 details the Dragonmarks and the noble houses that possess them. Dragonmarks have always been an interesting bit of flavor in Eberron. They are effectively a tattoo-like birthmark that bestows a degree of magical ability depending on their shape, size and complexity. In third edition, the mechanics behind it were Feats that a character took as they levelled up. In 5th Edition, they are treated as variant races or subraces (i.e. a Mark of Warding dwarf instead of a hill dwarf). You can still take additional feats as you level up to increase your mark’s power but the entry barrier is somewhat lower. Each of the 12 Dragonmarks are detailed including their abilities, what the House that possess that particular mark is known for, and what characters with that mark tend to be like. Chapter 5 is currently two pages discussing magic items. Only some of the most common ones are currently presented. It is possible that more will be added in the future (more on that in a minute). Chapter 6 wraps up the book with details about Eberron’s most famous landmark, Sharn, the City of Towers. Sharn could be a campaign setting by itself. In fact, an entire book was devoted to it in 3rd Edition. Sharn is a vertical city held together by powerful magic and is the height of technology, culture, and (for some) comfort in Eberron. This chapter devotes a page to each of Sharn’s quarters as well as providing Starting Points for adventures and campaigns. These are quick start locations like the mean streets of a crime-ridden lower district, or Morgrave University which funds expeditions to uncover lost mysteries. There are some random encounter tables designed around these different areas that will help bring flavor to your game as well. At the back of the book are a few Appendices. The first lists where to go for further Eberron material. Besides the previous sourcebooks that are listed, there have also been novels and comics published as well. There is a convenient glossary that not only gives the definition of a word, but also in what chapter more info about that word can be found. The final appendix contains illustrations of the crests for each of the Dragonmarked houses and a couple of maps. There’s a lot here, and more may be on its way. One of the glaring omissions from this book is the popular Artificer class that allows players to create their own magic items and potions. This class was first introduced in the 3rd edition setting and has been a staple ever since. A 5th edition version of that class does exist also as an unofficial playtest available on Unearthed Arcana. But, it was left out of this book upon initial release because, according to Wizards, it still needed some tweaking before being ready for the “official” stamp. The implication being that it would be added later. This leads to a particularly interesting topic, the notion of content as a living document. We have seen many of the creators on the DM’s Guild publish updates, fixes, and errata to their creations once players try them out. It only makes sense from that unofficial, homebrew perspective, but digital distribution now allows for the actual publisher to create updates and revisions without another print run. An update was published in the first 24 hours after release and, because of the distribution platform, everyone who had already purchased it received a notification that it was available for download. The price point for Wayfinder’s Guide to Eberron is $20 USD. That’s a great price for nearly two hundred pages of content. If you have any interest in Eberron or are looking for a new setting for your campaign, this is definitely worth checking out. 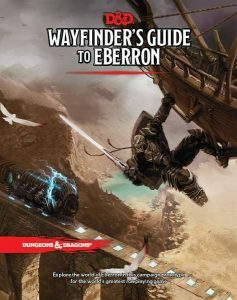 Wayfinder’s Guide to Eberron is available on DM’s Guild (http://dmsguild.com) and the game mechanic content is available on D&D Beyond (http://dndbeyond.com) for purchase as well. Than Gibson is a writer, artist, and lifelong Dungeon Master. He loves all things RPG-related and is the creator of Chronicle, a fantasy RPG setting and webcomic.